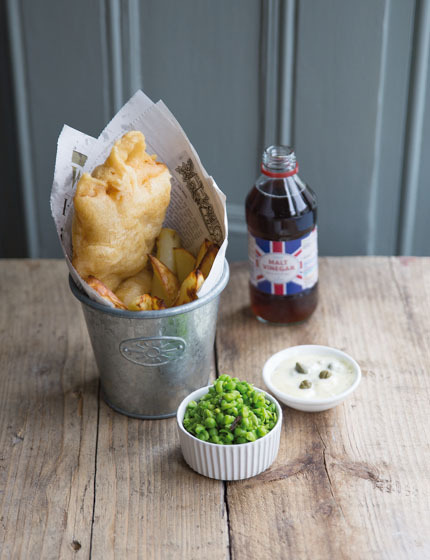 There’s nothing more British than a portion of fish and chips. Traditionally, this meal comes wrapped in newspaper and drizzled with malt vinegar. The best way to enjoy fish and chips is by the British seaside. Still, I find it can be a pretty nice home-made treat too. Watch me make these fish and chips in my little London kitchen – video here. If you want the recipe in Luxembourgish, you can get it here. Recipe from my first book Anne’s Kitchen. Start by making the tartar sauce. Put the egg and mustard into a jug and beat with an electric whisk. Slowly add the sun ower oil in a thin, steady stream while beating vigorously. Add the lemon juice, capers and gherkins and season with salt and pepper. Put into a little bowl, cover with cling lm and keep in the fridge until needed. Put the our for the sh batter into the freezer for 15 minutes. Preheat the oven to 220°C fan. Peel the potatoes and cut into wedges. Cook in a saucepan with boiling salted water for 3 minutes, drain and put onto a baking tray. Drizzle the potatoes with the sun ower oil and season with salt. Bake for 15-20 minutes, turning the turning the potatoes at least twice, until golden brown and crisp. Meanwhile, prepare the sh batter. Put the cold our, baking powder and salt into a bowl, then add the cold lager while whisking. Heat the sun ower oil in a deep saucepan until a drop of batter sizzles and crisps up straight away. Dip two sh llets into the batter, making sure they’re completely covered, then carefully lower into the hot oil and fry for 6-8 minutes, until golden and crisp. Take out of the fat, put onto a baking tray, cover with foil and put into the hot oven to keep warm. Repeat with the remaining sh llets. While the sh is frying, prepare the mushy peas. Boil the peas in salted water for 5 minutes, drain and put back into the saucepan. Add the butter, mint and lemon juice and season with salt and pepper. Blend into a mash with a hand blender. For a real authentic taste, serve the sh and chips drizzled with a dash of malt vinegar.